Linda was the coordinator of this joint trip of the Palm Beach Pack & Paddle Club and the Florida Sport Paddling Club, and she did a wonderful job. Everything was well planned, from the directions to camping and launch points, to the landing at the end of the trip with the shuttle arrangement back to our cars. Thank you Linda! Pinguino had only been on day trips till Arbuckle Creek. This short overnight creek based trip seemed like a perfect time to try Pinguino as a touring boat. I could get a lot of gear in Pinguino, especially larger gear through the big back hatch. Pinguino did fine until we came to the one rapid on the trip. I managed to find a hidden rock and punch through the fiberglass covering the wood underneath. A report on how I made the repairs will follow soon. 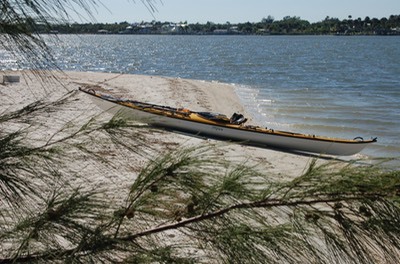 Click here to go to the Florida Sport Paddling Club's Home Page. How do I describe the surprise and wonder of Arbuckle Creek? Beautiful? Wild? Peaceful? Serene? Magical? Unexpected? All these terms and more are appropriate! 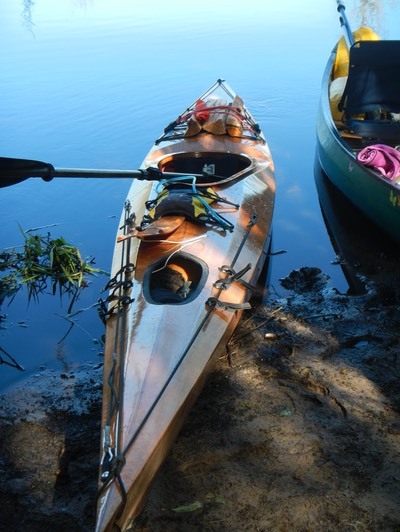 This was my first trip with the Florida Sport Paddling Club. 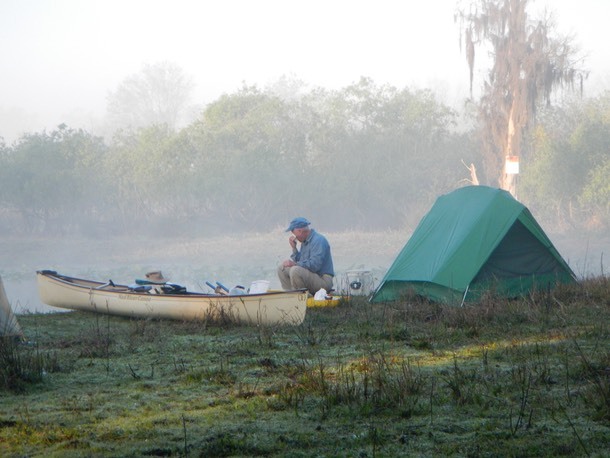 I had joined after hearing about the club at the 2011 Paddler’s Rendezvous in Titusville but had never had the time to join a trip. That, and the fact that I didn’t know anyone in the club and would have to join the group solo held me back. I had gone solo with other groups in the past with mixed results. Some groups are friendlier and more open to new comers than others. The FSPC proved to be very welcoming. 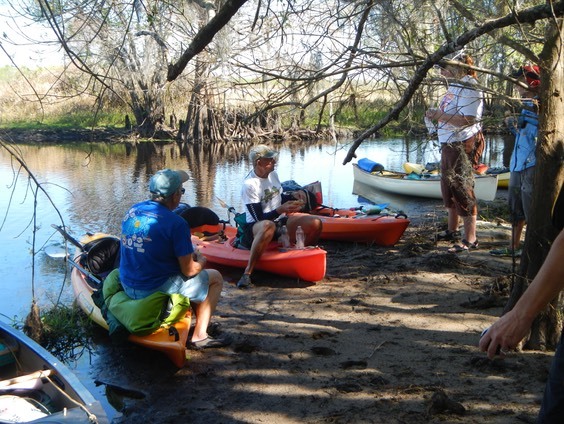 Friday: About two-thirds of the group of fourteen paddlers met on Friday evening at the Reedy Creek Campground in the Arbuckle Tract of the Lake Wales Ridge State Forest. This is a semi-primitive campsite in that only porta-potties, a few picnic tables and fire rings are supplies in several large nicely maintained campsites. Fees are $10.00 per campsite, collected on the honor system. 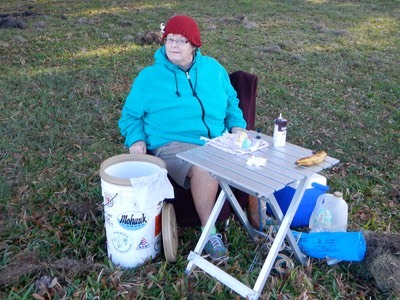 I arrived mid afternoon and set up camp. After meeting folks and having dinner a campfire was ignited which I enjoyed till about 8:30 when cold drove me into my tent. Saturday: I slept fitfully, as it was very cold, colder than I had prepared for. A camp thermometer registered 40 degrees at sunrise. I layered up with long johns, long pants, socks, a shirt , two sweaters and a watch cap before cooking breakfast of a hardboiled egg (protein), oatmeal (carbohydrate) and coffee with the luxury of real half and half! 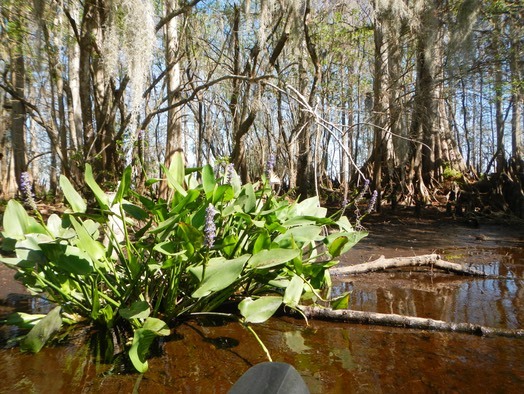 But this is Florida, so by the time we launched at William’s Fish Camp it was sunny and warm and I was into my usual paddling clothes. This creek is wild, unexpectedly wild, lined with towering Bald Cypress trees dripping Spanish Moss. 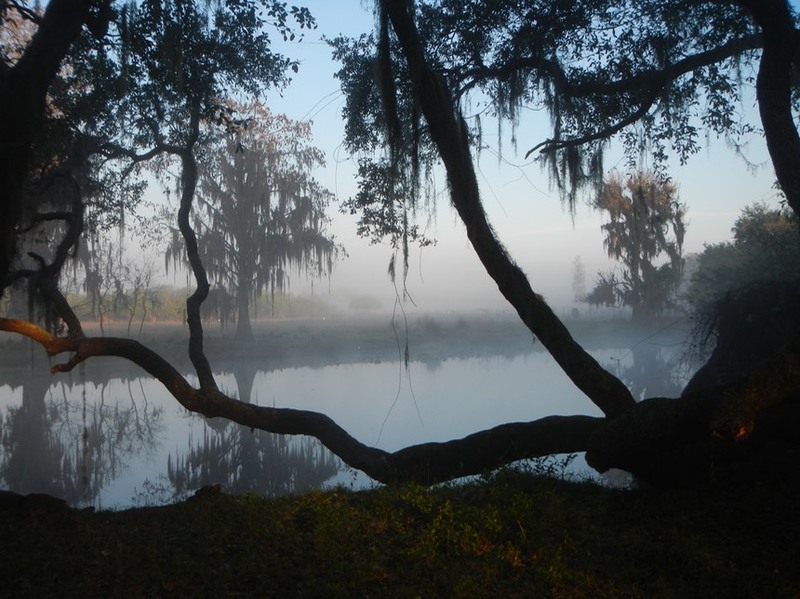 Below them are Live Oaks, twisted into fantastical shapes, draped out over the creek and along its banks. And below these, an understory of Palmettos and other low plants. 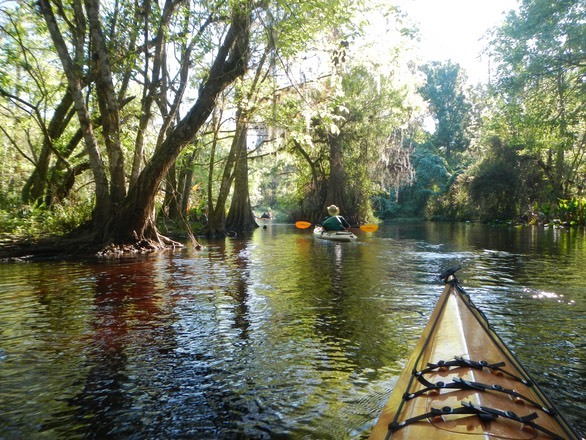 The creek meanders south through switchback twists and turns, snaking under dense forests and then through remarkably open pasture land rimmed along the creek bank with clusters of giant trees, their broad bases buttressed against Florida’s occasional high winds and water. In the pastures the cattle paused to watch us pass, curious about us, as we were curious about them. Occasionally they would bellow and run off, afraid of the aliens in their quiet world. The paddle was idyllic, with often just the sound of my paddle breaking the surface of the water, only occasionally punctuated by the sweet songs of distant birds and the mutterings of the ever-present Ibis along the shore. There were none of the civilized background noises we have come to accept. No highway noises. No airplanes. No radios or loud machinery. Just silence and nature’s own wild symphony. 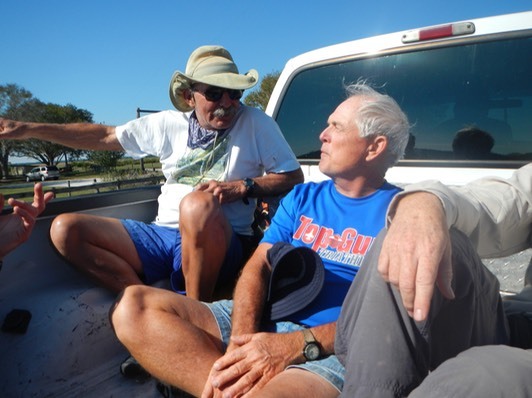 We stopped for lunch around noon, then went on to our overnight camping spot in a pasture backed by trees and scrub on a high bank at a bend in the river. 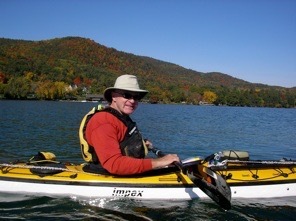 We had paddled sixteen miles by GPS. There was evidence that cattle had been through from a sprinkling of fresher and older cow pies. Being resourceful, Fred turned his paddle blade into a shovel and scooped up the pies that were in the way. I joined him in a game of “toss the pie” into the brush. The cattle had kept the grass well trimmed making for a large and comfortable campsite. Our dozen or so tents were spread out across the pasture with plenty of room for everyone. We spent a lovely late afternoon soaking up the sun from our west facing campsite. I cooked a hardy meal of rice pilaf and pulled chicken barbeque and quietly ate it as I watched a glorious sunset. 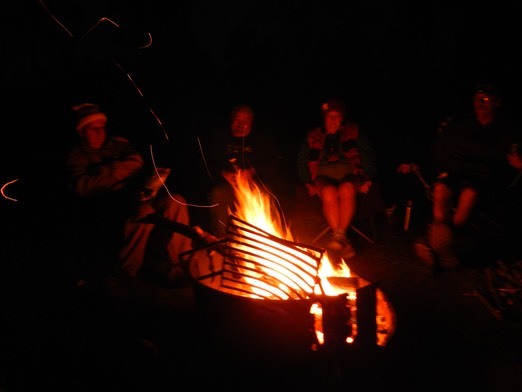 Soon the campfire was lit and we all sat around telling stories until fatigue and cold sent me to my tent for a glorious nine hours of sound sleep. Sunday: I was awakened around 7 am by a cacophony of deep growls, loud bellows and high pitched calls that had me thinking I’d woken up in Jurassic Park surrounded by dinosaurs. 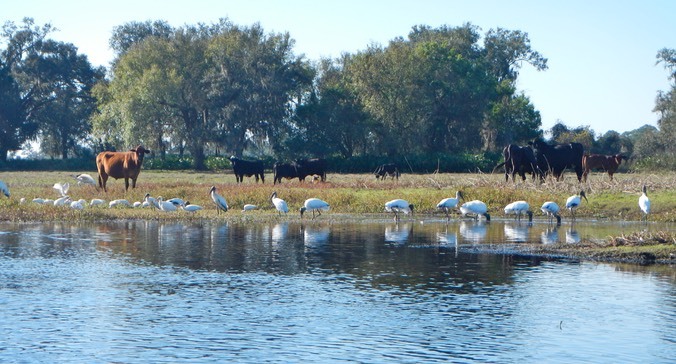 The noise was coming from both sides of the creek, generated by bulls on either side roaring at each other and prancing along the shore in their best macho bull style, warning the other not to dare come across. The bulls were joined by cows on both sides, supporting their protectors with still more loud calls. It was quite impressive. Thankfully, they all stayed out of camp. We launched at 9:30. The creek was straighter and wider here with more open pastureland, different but still beautiful. Our distance today was to be ten miles, which we covered by 2 pm. This stretch held the only “rapid” on the creek. I managed to find an underwater rock with my wood and fiberglass boat, putting a significant fracture in one plank that will need repair. (Somehow I am skilled at finding rocks others seem able to avoid. In the future, look for a posting on this website on how the repair was made.) The rest of the adventure amounted to a ride back to our cars, then packing up boats and gear, goodbyes and heading for home, all in all a great experience. I’ll look forward to paddling with this club again.